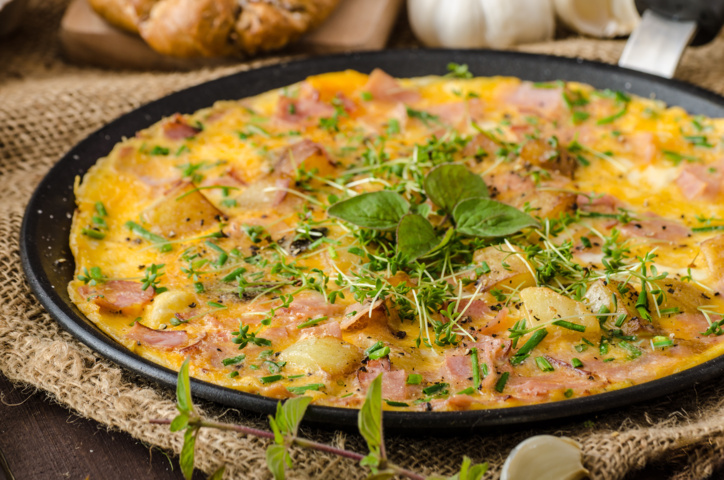 Melt butter in a large nonstick skillet over medium-high heat; add white onion, pepper, ham and half the parsley. Cook 5 minutes, until onion is softened. Combine eggs, coconut cream, water, salt, Italian seasoning and half the cheese. Add egg mixture to pan. Cook, stirring constantly, until the eggs form soft, creamy small curds, about 5 minutes. Remove from heat; sprinkle remaining cheese over top of eggs. Place skillet under broiler; cook until cheese is bubbly and golden, about 3 minutes. Cool slightly. To remove frittata whole, tip skillet to one side and use a spatula to loosen edges. Slide onto a serving platter; top with remaining parsley.